The Bowl and Berry has two locations to date: their original spot on NW Bethany Blvd in Beaverton, and their Bridgeport spot in Tigard. 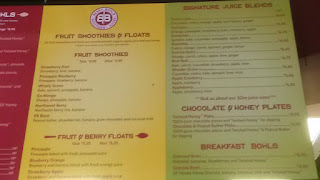 For this blog post, I met with the owner at their original Bethany location. Shaina moved from Hawaii in 2010 to attend college. 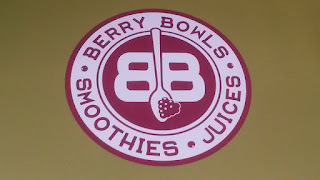 After graduating, she wanted acai bowls (found all around Hawaii), but had trouble finding them in the Pacific NW. 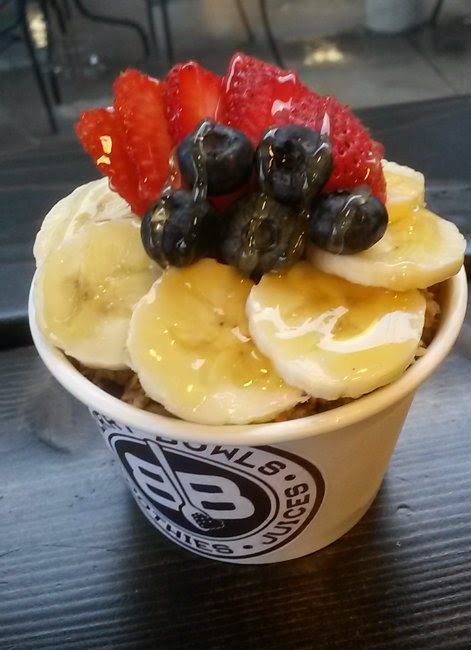 This inspired her to create her own acai bowl and open her own place. 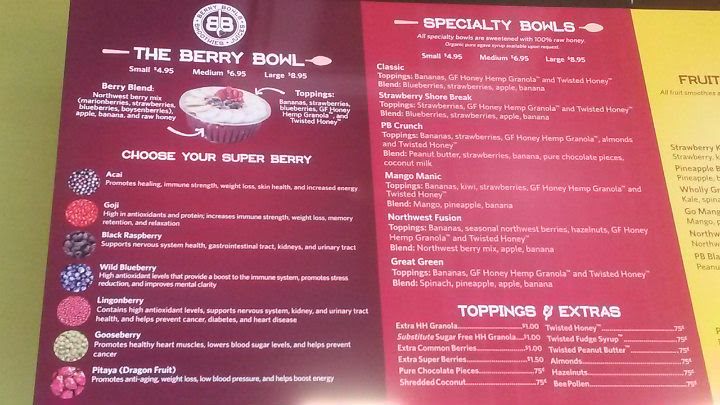 Half the menu showcases their various bowls. 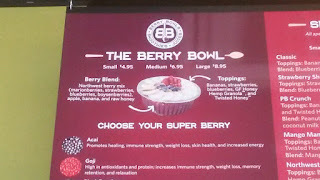 The acai berry (or any other "super berry" on their menu) is blended up smoothie-style with a Pacific NW mix of berries (marionberries, strawberries, blueberries, and boysenberries), along with raw honey, apples, and bananas. That makes up the base of the bowl. Then, gluten-free hemp granola, Twisted honey, and fresh fruit (bananas, strawberries, and blueberries) are added on top. Aside from acai, you can try goji berries, black raspberries, wild blueberries, lingonberries, gooseberries, or pitaya (dragonfruit). More options than I can find anywhere else. 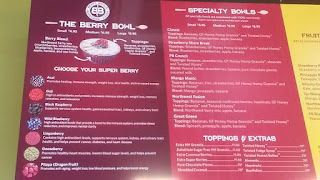 I started with the traditional acai bowl ($4.95 small). It's extremely well done, from the stunning presentation to the combination of ingredients. The bowl is not too sweet, and would especially be welcome on a hot summer day. But heck, even when it is 40 degrees outside, I'll eat this anyway. 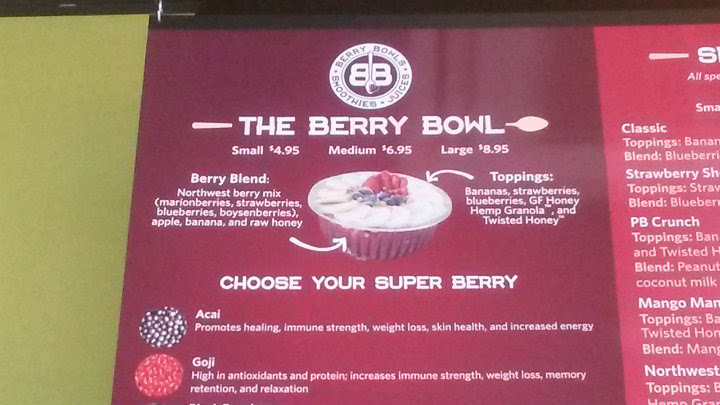 Specialty Bowls take the concept of those superberry bowls and bring potentially different ingredients into play. 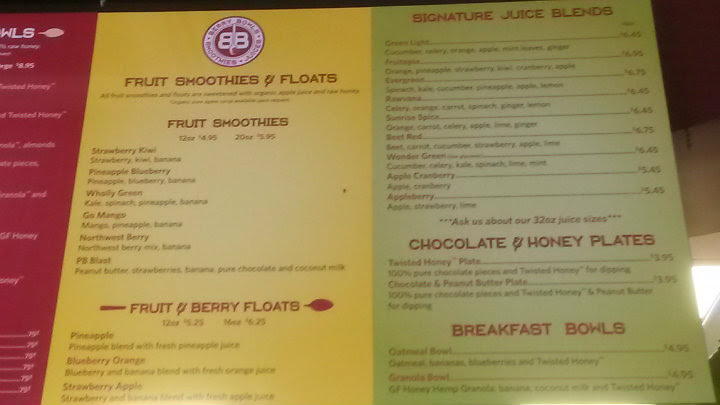 The PB Crunch bowl, for example, has peanut butter and chocolate in the blend. Tropical fans may also enjoy the Mango Manic, which has mango in the blend and fresh kiwi as a topping. 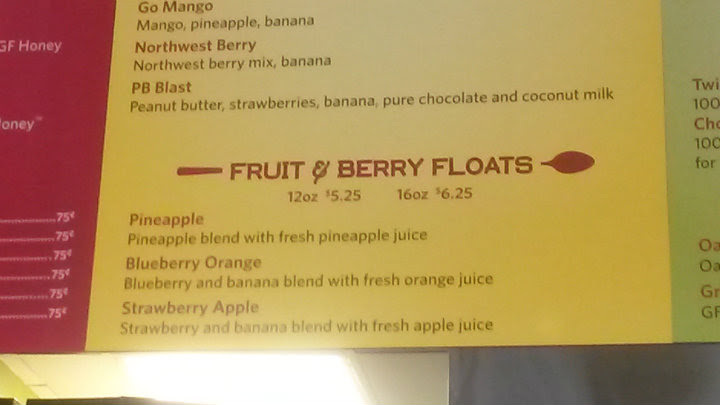 The Fruit and Berry Floats are a unique item on this menu. No dairy, just frozen fruit and fruit juice. 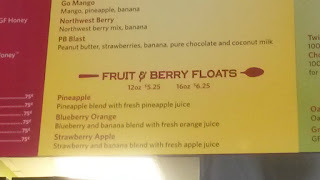 For me, the star of the show was a Pineapple Fruit Float ($5.25 for 12 oz). 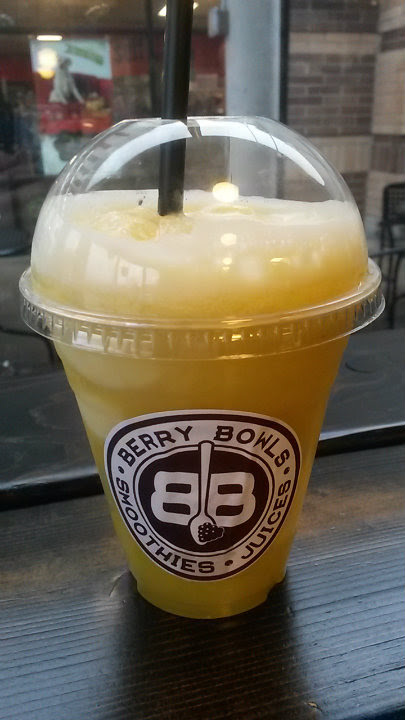 Pineapple juice meets blended frozen pineapple. Not too sweet and not sour, just right. A few pineapple "balls" (perhaps done with a melon ball scoop) were still in the bottom of the cup. 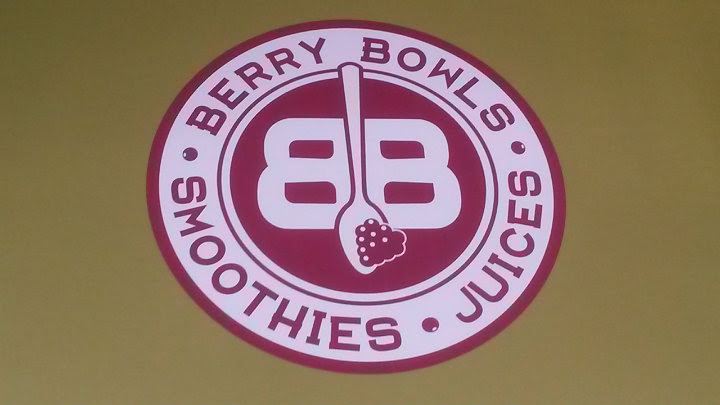 I think Bowl and Berry could benefit from having a bubble tea straw instead of the regular straw. If you love sweets, try a Chocolate and Honey Plate. They have 100% pure cacao paired with Twisted Honey on the side. That honey will make a normally very bitter chocolate worth having. As a note, I've had 100% cacao by itself -- and it's not too pleasant. 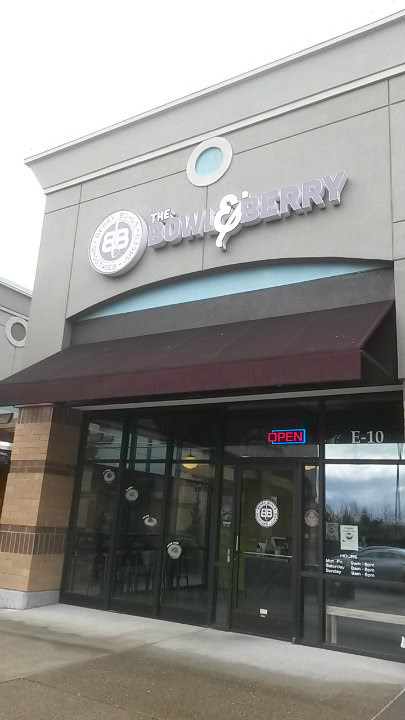 The Bowl and Berry recently celebrated its first anniversary at the Bethany location. Later this year, in September, Bridgeport will turn one. It's an impressive start to get two spots going in such a short period, and there are plans for more locations. I hope Vancouver is a potential spot down the road, then I won't have to travel as far. Typical lazy panda syndrome.